Character pose art in classic Edo period Japanese garments. For free use in your creative works. No restrictions. 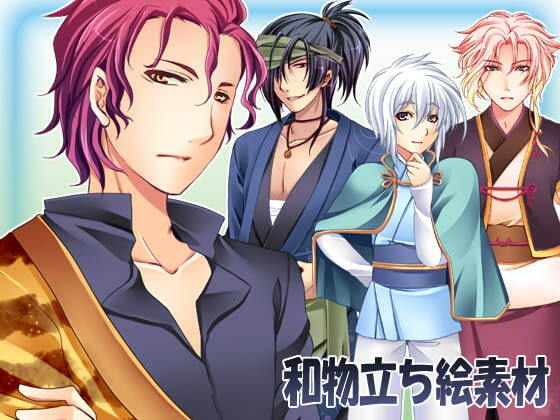 Highly recommended for that "otome game" look. * Please note there are no clothing variations. I bought this because I enjoy collecting pose art materials and character creating stuff anyway. On top of that I make visual novels as a hobby, but sadly have no artistic talent. It's difficult to come across male pose art material, as a large quantity of what I can find is all female. The art in this pack is pretty, as mentioned in the description, it's quite otome style, which is exactly what I was looking for! There's not a whole lot of variation in facial expressions, but then this is clearly stated in the description so you can't really be disappointed. My favourite character is the guy with the headband only displaying one eye, he has some really lovely smiling expressions. All of the fellas are gorgeous though. The PSD is easy to edit, within a second of opening the file I was able to begin changing colours of the individual layers. And since you can remove the facial expressions entirely, it wouldn't be difficult to add some of your own anyway. Considering how cheap this set is, I would definitely recommend it for visual novel character art.